I am, indeed, delighted to be here today. 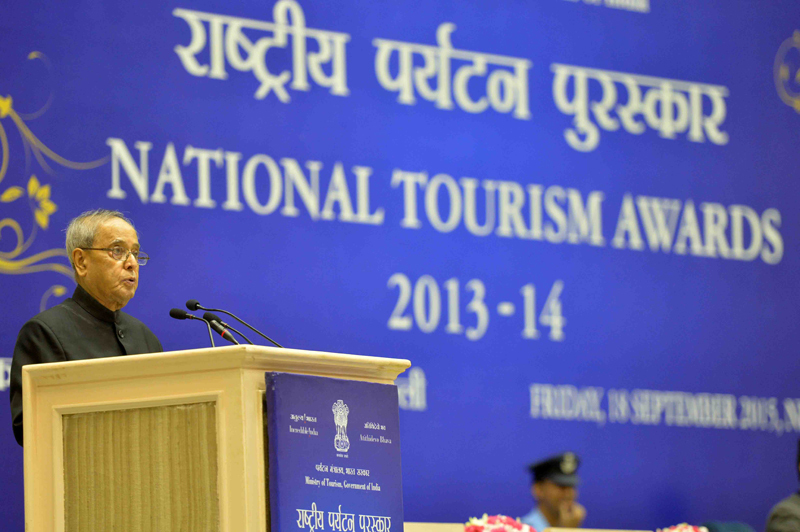 I join you in felicitating achievers in India’s Tourism industry. These exceptional individuals and institutions have distinguished themselves through their dedication in promoting India as a tourist destination. They have made outstanding contributions to the development of our tourism sector in terms of quality and capacity. I would like to congratulate the award winners. The honours conferred today will, no doubt, reinforce the commitment of all the stakeholders in the tourism sector and motivate them to work with renewed vigour for its expansion and growth. Tourism in our country is an agent of development and an engine for economic growth and employment generation. Trained human resource is an important component for the development of any sector. I am happy to know that the Ministry of Tourism has paid attention for creating trained human resources to meet the requirements of the tourism sector and the hospitality industry. The Institutes of Hotel Management (IHMs), Indian Institute of Tourism and Travel Management (IITTM) and Food Craft Institutes (FCIs) provide avenues for getting education and training to serve in the tourism sector. The ‘Hunar-se-Rozgar Tak’ scheme of the Ministry of Tourism under which training is being provided to the youth is a laudable initiative for bringing social equity and employment opportunities to the weaker sections of the society. In 2014, a total 1282 million domestic visits in India were recorded. In that year, India had 7.68 million foreign tourist arrivals registering a growth of 10.2 percent over the previous year. However, it comprised a mere 0.7 percent of the international tourist arrivals worldwide, which was 1.1 billion. Hence, there is tremendous scope for a manifold rise in tourist arrivals from abroad. The foreign exchange earnings from the tourism sector during 2014 were Rs. 1.2 lakh crore with a growth rate of 14.5 percent. I am glad to share with you that the implementation of e-Tourist Visa, for 113 countries, is showing excellent results. Many of the high potential countries like USA, UK, Spain, Malaysia, Germany, etc. now have the e-Tourist Visa facility. During January to July, 2015, close to 1.5 lakh tourists arrived on our soil through e-Tourist Visa. With the growth of the Indian economy and the increase in disposable income of our people, we may expect tourist inflows to remain on a positive trajectory in the years to come. We must pay focussed attention to the building of a high quality tourism infrastructure in the country. The launch of two initiatives - Swadesh Darshan and PRASAD (Pilgrimage Rejuvenation and Spiritual Augmentation Drive) - aiming at integrated development of circuits and pilgrim centres would go a long way in achieving this objective. The safety mechanisms that we create, the precautions that we put in place must reassure our guests - so that they never have to be apprehensive about their personal safety or that of their belongings. The Ministry of Tourism has taken the initiative to address the safety concerns of the tourists by launching 24x7 Incredible India Helpline to provide the tourists valuable information and to guide them during emergencies. The ‘Welcome Booklet’ being distributed at immigration counters containing information on Dos and Don’ts for tourists would also be a helpful aid for foreign tourists immediately on their arrival. Inconsistent sanitation standards would, similarly, have a negative impact. This would be unfortunate – especially at a time when our tourism industry is projecting the unique beauty of our cultural sites, the scenic splendour of our adventure destinations and the richness of our architectural heritage. The Ministry of Tourism’s ‘Swach Bharat-Swach Parayatan campaign’ to promote cleanliness and hygiene at tourist destinations is a welcome step in the right direction. It calls for all stakeholders to work together to achieve this goal in all aspects of the "India” experience. I would also stress that it is essential for the Tourism Ministry to take the lead and set the highest standards in this regard. It is equally important to develop systems for effective monitoring to ensure that these standards are maintained by establishments across the board. Quicker access to distant locations, larger disposable incomes and rising lifestyle aspirations now characterise the growing numbers of travellers. I urge the tourism industry to consciously plan its investments in a manner that the growth of this sector is sustained without compromising our natural and cultural heritage. New and innovative methods should be introduced to conserve energy and water. It should be incumbent on tourist establishments and hospitality units to operate in a way that they are able to reduce water and energy consumption, cut down on the generation of waste, improve waste management and ensure creative recycling and efficient waste disposal. Broader social contacts between tourists and receiving communities go a long way in enhancing mutual understanding, tolerance, and awareness between peoples. Tourism translates into closer collaboration and cultural exchanges across the nation and with distant communities all over the world. India offers one of the best tourism experiences in the world and I have no doubt that collectively we can earn India its rightful place in the tourism map of the world. I once again congratulate all those whose initiatives and hard work have won recognition today. I wish all of you great success in growing and expanding our tourism industry in the years to come.